Well, it does not have a stellar acronym (BLLWRSG) or even an APE (Acronym- Producing Expression) but the Benton-Lane-Linn Water Resources Study Group is moving right along. Even has a WWW site now. I posted about this group (albeit with a different name) in July 2009. Working to address water issues, Benton, Lane, and Linn Counties (conveners) and their partners will seek to understand, pursue projects and offer recommendations to governing bodies concerning the region’s water quality and quantity. County Commissioners lead the Study Group, which began collaborating on the water issues crossing jurisdictions in March 2009. The Study Group finalized a Work Plan in December, 2009. There are two strategies--short- and long-term. The value of the two strategies is forming and accomplishing immediate work with limited formal/policy related process and funding required. Conversely, longer term work is dependent on internal and external funding (grants), intergovernmental agreements and other more complicated and lengthy processes. To ensure a reliable supply of clean water for all users and beneficial uses and inform the decision-makers in Benton-Lane-Linn Counties, the Benton-Lane-Linn County Water Resources Study Group will: 1) comprehensively examine shared water resources quantity, use and quality issues; and 2) work collaboratively and transparently to address water issues. I'm heavily involved with this group and am enjoying my participation. We have some visonary County Commissioners involved: Linda Modrell (Benton; she initiated the group); Will Tucker (Linn) and Rob Handy and Bill Fleenor (Lane). My faith in local politicians has been restored after working with these folks. Local governments seeking to take charge of their water futures! In which direction this group heads is anyone's guess; I know where I would like it to head. But for now, the short-term calls: I've got to get back to writing a proposal for the BLLWRSG. It is due to the U.S. Army Corps of Engineers by 1 PM 1 June 2010. Plenty of time! A few days ago Emily Green posted on the consolidated salmonid case and the recent decison by Federal District Court Judge Oilver Wanger regarding freshwater exports from the Bay-Delta system. Also check out an earlier post from her. Looks like good news for the proponents of freshwater exports from the Bay-Delta system. Good reading from Ms. Green, as usual. That takes care of the 'fish.' Here comes the 'foul' (as in wastewater treatment plant). By now, almost everyone interested in the Bay-Delta knows that Dr. Patricia Glibert, a member of the NAS Bay-Delta Committee, on which I serve, was asked to resign because of research she published indicating that discharge from the Sacramento Regional County Sanitation District's plant was a root cause of degradation of the Bay-Delta ecosystem. In other words, potential good news to those who don't think freshwater exports are the main cause of the fish declines. I have read that some people seem to think that our committee will now discount Glibert's research. That is not true at all. If her work is peer reviewed (I assume it is, but I have not seen the paper) then it will be considered along with all the other peer-reviewed work. In fact, at the committee's invitation, Pat will address the committee and discuss her work when we meets in Sacramento in mid-July. Presently, the committee is preparing to move into phase two of its assignment, which will probe in depth other “stressors” on fish such as are addressed in Dr. Glibert’s paper. Prior to the upcoming meeting in mid-July, Dr. Glibert will be replaced so as to maintain the committee’s expertise and balance. Dr. Glibert has been invited to the July meeting to present the results of her work in public session. Rest assured, the committee will be fully and appropriately populated as we move into the second, important phase of study. Friend and colleague Todd Jarvis told me yesterday that today's post over at Rainbow Water Coalition was going to be a blockbuster. He was right, of course: it details the sorry tale of what happens when a state agency, the Oregon Department of Environmental Quality, establishes an advsory commission, the Graywater Advisory Commission, ostensbily to seek advice, then proceeds to subvert the advisory process. I indicated in previous postings a few reasons why I left the Oregon experience in graywater. At the first meeting, the Oregon DEQ staff attempted to indicate that the advisory group process was going to follow a consensus-based approach to deciding upon what topics were important to the rules and regulations governing graywater reuse. But it was obvious from the onset that the DEQ had a pretty good idea of how they wanted the program to go given their debate over some of the words in HB 2080, including, but not limited to, issues of beneficial "use" versus "purpose" and what "disposal" really meant, almost reminiscent of the famous debate over what "is" is. Friend Jim Thebaut's DC water events are just about upon us. They've been rescheduled from February 2010. Here are the invitations to the evening event on 16 June and the noon 17 June lunch/panel discussion at CSIS. The evening event will feature a screening of a trailer of Jim's new film, Running Dry: Beyond The Brink. Jim told me today that it is quite different from the previous films in the franchise. And actress Jane Seymour will be there, too. Here are my posts on the original February 2010 event and last summer's event. Unfortunatetly I won't be able to attend; I will be at the agricultural groundwater conference in Burlingame, CA. Hope you get a chance to attend one or both events. 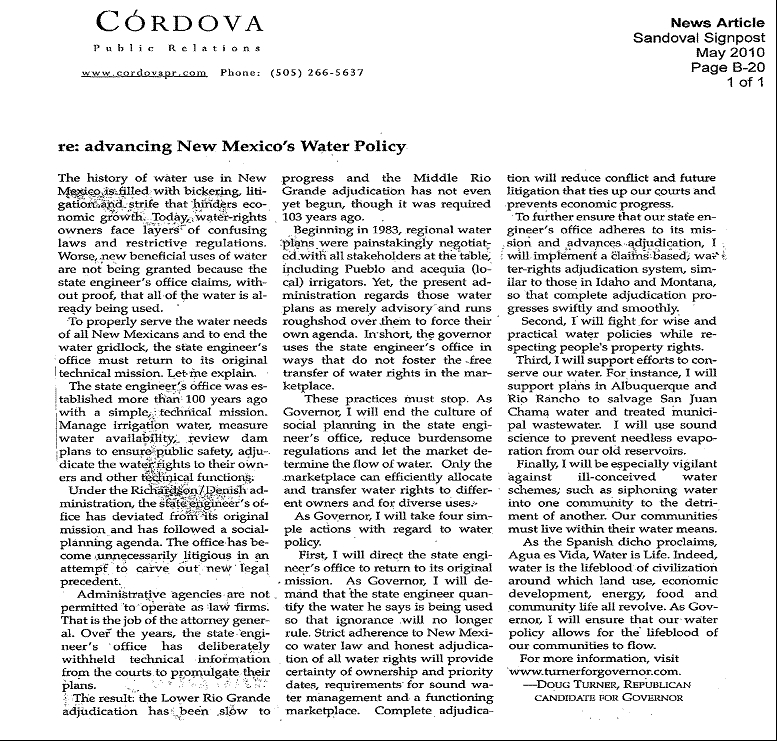 Will New Mexico Water Policy Suffer the DTs? So is New Mexico water policy really about to enter rehab? Not that I know of; in this case I'm not referring to delirium tremens (aka 'the shakes') but to 'Doug Turner' who is seeking the Republican nomination for governor in next week's primary. When most New Mexicans hear the name 'Turner' juxtaposed with 'water' they generally assume that 'Turner' is Dr. William 'Bill' Turner, erstwhile seeker of the Republican nomination for U.S. Senator, well-known hydrogeologist, water marketer, and, according to some, water gadfly. Bill, whom I consider a friend, once filed a water-rights claim to the evaporation ( c. 180,000 AF/year, give or take) from Elephant Butte Reservoir because it was not being put to beneficial use. At the time he filed his claim one of my students was in the division of the New Mexico Office of the State Engineer (OSE) that had to process the claim. She would become apopleptic at the mention of his name, and probably still does. And don't tell Bill that 'groundwater' is one word. But I digress, because this post is about his son, Doug Turner, who wrote the following piece in the print edition of the Sandoval Signpost, a suburban paper covering Sandoval County in the Albuquerque metropolitan area. The copy pasted below is of poor quality; click on it for a larger copy, or on 'view this photo' to view a JPEG of the article. If you can't or don't want to read the article you can trust me: Turner not a fan of the OSE. He accuses it of engaging in social planning, riding roughshod over regional water plans, and in general, promoting Gov, Bill Richardson's social agenda and deviating from its constitutional mandate. ...burdensome regulations and let the market determine the flow of water. Only the marketplace can efficiently allocate and transfer water rights to different owners and for diverse uses. So will Gov. Doug decide which water schemes are ill-conceived? The last sentence threw me. Water means? What does that mean? Remember, Turner is a market guy - let the market allocate water because it knows best. So if one community has the money and can buy or lease water rights for its own use from another community shouldn't it be allowed to do so even if that involves 'siphoning' the water? Isn't that a 'diverse use' Turner alluded to earlier? That's what the market is supposed to do. Perhaps Turner would insist that Albuquerque surrender its consumptive right to almost 50,000 AF/year of San Juan-Chama water because it comes from the Colorado River basin, not Albuquerque's own Rio Grande basin. I would say the Albuquerque is living beyond its 'water means.' I suppose that Gov. Turner would also be opposed to a privately-funded pipeline to take water from the Pecos River basin and sell it to Santa Fe in the Rio Grande basin. In any case, Turner does not sound like much of a free marketer. More like, "Let the market do what it does, but I need to approve the transfer lest it is an 'ill-conceived water scheme.'' " Sounds like social planning to me. A marketer would let the market determine whether a water scheme is ill-conceived. Right, Doug? David Zetland, wherefore art thou?